It’s a sad thing to read an obituary and discover that someone wonderful was alive for many years and you never knew it. It happens to me a lot. The only saving grace is that now, at last, I know about them and I know they made a difference and I’m grateful. Camilla Williams. Photo by Carl Van Vechten, 1946. Today, I’m grateful for Camilla Williams. That she died the other day, at the beginning of Black History Month, means that many people who have never heard of her will learn of her significance at just the right time. 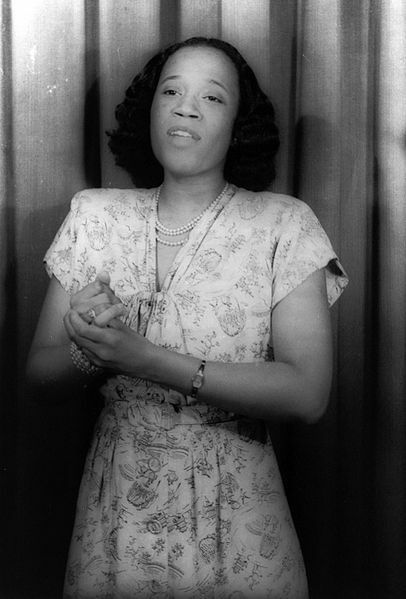 Camilla Williams was the first black woman to sing with a major United States opera company. She did that nearly a decade before Marian Anderson graced the stage of the Metropolitan Opera, only she sang with the Met’s poorer cousin, the newly formed New York City Opera. Camilla Williams was born in 1919, the daughter of a chauffeur and a domestic worker in the then Jim Crow town of Danville, Virginia. Her family was musical,, but she might not have discovered opera if a Welsh singing teacher hadn’t come to town. He’d heard there were beautiful black voices in town: he wasn’t allowed to teach them in the white college where he worked, so the class met in a private home, and at twelve years old Camilla Williams learned to sing Mozart. Over the next eight years she sang roles like Nedda (Pagliacci), Mimi (Boheme) and Aida at New York City. She also appeared with the Boston Lyric Opera and the Vienna State Opera, and was a soloist with some of the world’s leading orchestras. She sang Bess for what was then the most complete recording of “Porgy and Bess” (Columbia Records), and toured worldwide as a recitalist. Over the years, she crossed paths with Marian Anderson many times. At the 1963 March on Washington, she sang “The Star Spangled Banner,” just before Martin Luther King’s “I Have a Dream” speech, substituting for Anderson who was caught in traffic. The two women were fast friends. Ms. Williams was married to a civil rights attorney for 19 years until his death in 1969. She taught singing first in New York City and then at Indiana University’s Jacobs School of Music at Bloomington, where she retired in 1997. In 1947, she had met Bulgarian-born pianist, Boris Bazala, who became her accompanist. The two traveled and concertized together for many years, and remained friends for the decades after. Bazala remembered the challenges she faced because of her race. He insisted on riding in the back of the train when she was only permitted to ride in front; often, they couldn’t sit together in restaurants. After his wife died, the two friends lived together and continued making music together until he died at 100 last year. Every day was a celebration of their friendship— the refugee from Eastern Europe and the woman who “opened the door for Marian Anderson.”. Thank you for this post. I’m glad to have stumbled onto your blog and will be back. Thanks for your interest. I like what I’ve seen of your post and plan to make it a habit.